Following negative desires leads to greed, which in turn leads to unhappiness, frustration, confusion, etc., as soon enough you will desire something you cannot have. So, follow your positive desires and don’t be greedy, and you will achieve contentment and happiness. A desire that arises from an essential need (food, clothing, shelter, etc.) 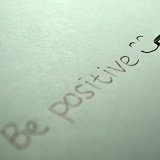 is a positive one. A desire that arises from an impulsive feeling is a negative one. Consider the full consequences of following the desire. Follow the positive desires only. Desires that arise from essential needs and have positive consequences are the ones you should follow—simply ignore the rest.